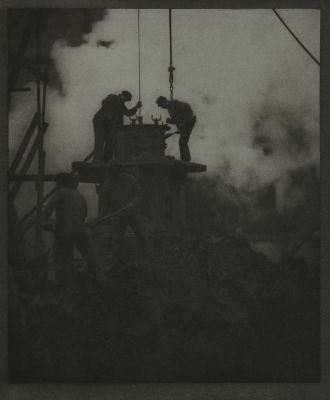 Alvin Langdon Coburn was one of few photographers who enthusiastically embraced the photogravure process to produce his own books and exhibition prints. When Coburn was young, he studied with the American painter-printmaker Arthur Wesley Dow, who instilled in Coburn the desire to combine art and craft. Shortly thereafter, during long visits to England, Coburn began learning the photogravure process at the London County School of Photo-Engraving. In 1909 Coburn settled in London, where he set up two hand-operated printing presses in his home. 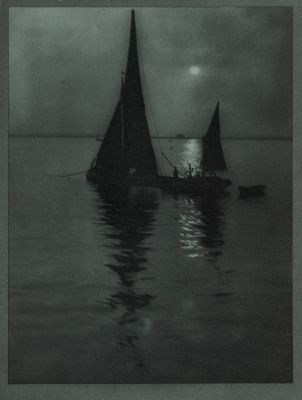 He produced two striking books, London (1909) and New York (1910), each of which were illustrated with twenty rich photogravures of impressionistic images. For both publications, Coburn personally prepared the printing plates, exposing, etching and steel-facing them; he then pulled proofs until he obtained a perfect specimen for his printer to match. Coburn closely watched as the prints were editioned. Coburn worked primarily as a portrait photographer and book illustrator, pursuits that frequently complimented each other. In his early twenties, he befriended British writer George Bernard Shaw, who happily introduced Coburn to many of his colleagues. Coburn subsequently illustrated books by G. K. Chesterton, Henry James, Robert Louis Stevenson, and H. G. Wells. Coburn illustrated twenty-five books between 1904 and 1965 with his high-quality photogravures. In 1908 he made a revealing self-portrait working at his own copperplate printing press–the quintessential photographer-printmaker.